Finding an inexpensive place to stay in England, especially when you’re within stone’s through of a major tourist attraction like a local cathedral. The Hub budget hotel in Peterborough attempts to offer quality temporary lodging at relatively inexpensive prices for travelers and visitors who have visited Peterborough but can’t afford to pay a small fortune while on their travels. While the idea of budget hotels can make some people cringe, there is a huge difference between places that cut corners wherever they can to keep costs down versus inexpensive budget hotels that really make an effort to hit that perfect place between quality and price. Thankfully, The Hub Budget Hotel in Peterborough definitely meets the second group, as can be seen by even their recent 2017 efforts at renovation and upgrading the facilities. Peterborough is most well known for the local cathedral, and thus has plenty of options when it comes to lodging. The Hub Hotel is a mere few kilometers from the big draw, and offers relatively inexpensive lodging with some basic rooms starting as low as 40 GBP a night. The location is also close to the local train station, making travel especially easy whether your main purpose is business or pleasure while visiting this corner of Cambridge. This location has been serving the greater Peterborough area for many years and continues to be a popular option among many travelers while they are visiting locally. In early 2017 The Hub Hotel embraced a major refurbished look to create a new brilliant aesthetic and attempt to make the hotel look even more welcoming and elegant for customers who can come in, relax, and enjoy their surroundings instantly. There’s no reason luxury and low cost should be mutually exclusive and the recent work has been focused on increasing the beauty and overall experience of the customers without losing the reputation for being an outstanding budget option. In other words, better looks, better aesthetics, a touch of luxury and no boost in the low prices that have made them a popular option for budget wary travelers and tourists over the years. Early reports seem to indicate that the changes have gone over extremely well as staff have talked about a further upsurge in new customers as word of mouth continues to spread about the quality increasing even more as the prices remain in an extremely reasonable rate especially compared to a lot of the local competition. Add in a popular and famous bar within the community that is attached to the property and it’s not hard to see why this is a popular choice with travelers. The bar will be seeing a bit of an overhaul, as well, though the main traditional aesthetic will stay. These are the first of many changes but the main goal remains the same: to make the services even better, the stay more comfortable, and to continue the legacy of outstanding service. That’s a tall order considering the history, but that dedicated focus is really helping to hit the mark with the new changes. There is a remarkable variety of options when it comes to the type of room, and with 71 rooms available, a serious effort is being made to provide the absolute best service to each and every one. A 24/7 front desk allows check-in during any hour of the day or night, which is especially convenient when the train schedule you had to deal with wasn’t. As with any place there are better days and worse days as far as pricing for rooms go, but there’s no denying that The Hub Hotel in Peterborough definitely stands out as being one of the best budget options around, consistently offering lower prices than many of their competitors looking to cash in on the nearby location of the downtown and of the famous Peterborough Cathedral. The number of rooms also means that you have options. You don’t have to overpay because there are only suites available when you were traveling solo and just needed a nice little spot to stay. They understand that a major part of traveling is matching up the right amenities and the right room to their specific needs. 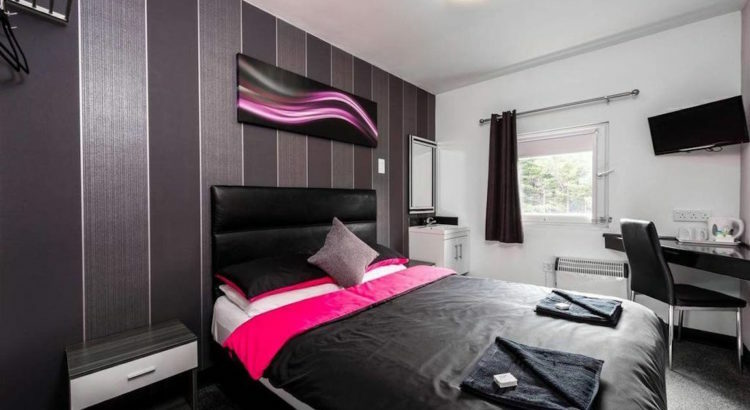 The double rooms offer a beautiful and clean room with a large comfortable double bed, a nice desk off to the far wall that acts as a work station, as well as a bathroom and flatscreen TV. The rooms are comfortable and perfect for individual travelers or couples looking for something simple but with a touch of luxury. Twin rooms offer much of the same but with individual twin beds and for families or backpackers, there are triple rooms for more bedding options in one room. There are many options available, and the commitment of The Hub to offer affordable quality is no doubt greatly appreciated by travelers arriving happy to get great service and lodging without completely breaking the bank.